Sentry-go Plus! is a low cost, expandable, network-efficient monitoring solution for Windows. Simply purchase the monitoring components you need for your server to build a customised monitoring solution. As your server's role changes, so can you your monitoring solution. 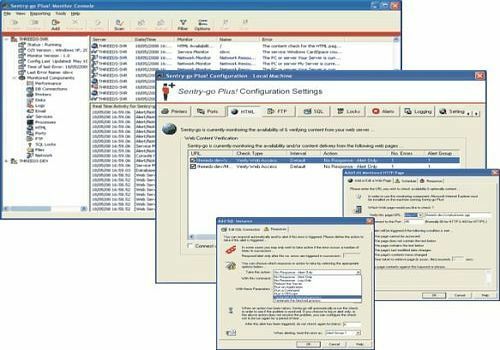 Monitoring options include services, processes, web & FTP sites, TCP/IP ports, event logs, log files, performance, connectivity, printing & files, SQL Server etc. Monitors your broadband address and reports changes by email. Always stay in touch with your PC. This utilitiy will detect change of IP address.